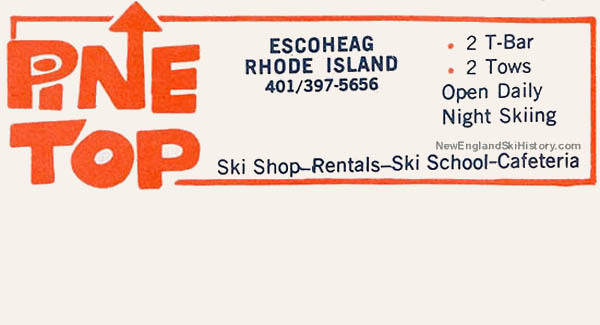 Pine Top Ski Area, located on Escoheag Hill near West Greenwich, opened for the 1965-66 ski season. With two T-Bar lifts and an advertised parking capacity of 1,200 cars, Pine Top was rumored to be the most popular ski area in Rhode Island during its heyday. The ski area featured snowmaking and night skiing. Due in part to poor snow years, Pine Top went into a period of decline in the late 1970s. An unsuccessful attempt was made to operate a summertime motorcycle park, in hopes to boost revenues. Pine Top likely closed in 1980. The base lodge was burned by vandals in the early to mid 1980s. "Would go up every weekend with our neighbor who was an instructor (Andy Depta).I eventually became part of the Ski Patrol and worked the weekends...(1977-79).Great experience for a young guy to have...lots of fond memories of all the nice people. " "Was on ski patrol from 1966 to just before they closed. I recognize some of the names on this thread. Patrolled with Bob Bolton, Mike Zarli, Boomer, Herman Wyss, Carl Potter, Louise Potter, and many more great people. Ski instructor friends included Dan Storti, Jane Kanasset (sp), Kathy Halloran, and Diane Sullivan. The patrol and instructors would have a reunion every 5 years or so and then they just stopped. People went on with their lives and lost contact with each other. Some of the best people I ever knew. Miss them all." "I have many happy memories of skiing Pinetop in the early 1970's. My Brother worked there, so I would ski there after school under the lights as often as possible. My father, brother and I went some nights and lots of weekends together. As I got older, it was always a good warmup for the bigger ski areas up North. I have grown into an advanced skier and have skied the biggest and steepest terrain in the West, but will always remember Pine Top with fond memories. One of my cousins also ran a Tucker snowcat there, and we also remember the summer that we tried grass skiing at Pinetop. They rented these crazy short "skis" with a belt around them running on a track. Anyone remember those?? Anyway, miss the place a lot. sad to see the lodge go and the land developed, but that's progress as they say?" "My family owned Pine Top. I was very young, but still remember going with my dad during off season to watch the motor cycle races & wallk/explore the area. Always remembered the fire engines at the bottom of the hill too. I loved it there." "Was introduced to pine top,by a very good friend of mine from Fall River,Ma,Jimmy the Cobbler,started and learned to ski there,would ski all day, then go right to work, driving all night,NYC and back, went on to ski all N.East then went and skied Zerrmatt Switzerland, hot dogged a lot wrecked my knees,but had a great time doing it, also taught a lot of newcomers, a lot older now but the memories are great. ?I "
"My dad Robert Bolton was a ski patrolman and I went with him all the time Now i’m On wachusett mountain patrol "
"My friend's aunt was Hope Holbrook would gave the ski report for radio " Direct from Pinetop Ski Area." "
"Pine Top was owned and operated by my Dad's cousin Howard Hamel. There was great night skiing and the lift tickets were affordable We loved the area." "Although I later became an avid skier, I used to visit Pine Top to ride and explore some of the best and most scenic motorcycle trail riding courses in the region. Even in winter-time, skiers and riders would enjoy the warm lodge and go their separate ways outside. " "I started skiing at Pine Top in 1965 when my Dad Mickey got on the ski patrol. Being on the ski patrol you got to ski for free but had to work one night a week and 1 weekend per month. The family also got to ski for free. I went with him almost every time he went. I got to know a lot of people over the years: Nagels, Waitkins and so many other families. The last day of the season they would have a festival: games, races and even got a bunny one year. So much fun! I never missed a year so I skied from 65 to 80 at Pine Top." "I started to ski at Pinetop in 1968.I was dating a serviceman from Quonset and he acquired the equipment from the recreational dept,on base.I do not remember the boys name,but have skied most of New England since and became a member of ski patrol at PineTop"
"When I was in 8th grade in 1970, I had collected all my Pine Top lift tickets on my jackets and my mother counted 36 Pine Top lift tickets. Early one morning after an all night snow, the manager asked my friends and I if we would like a free $3.50 for alittle work, we said YES! We were then asked to to side step across the entire slope from bottom to the very top, so we became snow groomers, without even knowing it." "I started skiing there in 1970 and skied there until 1974 when I could drive to the big mountains. I met my wife there at that time and we will be married 40 years this coming November. We spent almost every weekend there during those years skiing with the Wyss family, Cindy and her father who was on the ski patrol and her mother. It was a great family run ski area. It was ashame that it had to close so many years ago. " "we'd go up on weekends from Quonset and ski!that was 1968-1969!! I miss those days."